Dawn Spencer Hurwitz has launched the Italian Splendor collection, six new fragrances inspired by the Denver Art Museum's Cities of Splendor exhibit: Alba, Adoration, Divine Gardens, Medici, Secreti di Belle Donne and Venus & Cupid. Alba ~ "a creamy delight of white alpine flowers, orange blossoms, olive flower and white truffle". Adoration ~ "a classic golden incense with a heart of rose and a touch of smoke". Divine Gardens ~ "a fascinating green garden, floral chypre with notes of tomato leaf, mint, Mediterranean herbs and marigold". Medici ~ "a spiced leather oriental perfect for a young man but lovely on a woman". Secreti di Belle Donne ~ "inspired by the courtesans of Venice with notes of exotic oranges, saffron, spices, rich florals and a base of honied musk". Venus & Cupid ~ "a luscious fruity floral inspired by the intense sensuality of the ancients; notes of vine and fig leaves, wisteria, jasmine, sandalwood and acacia honey". The Dawn Spencer Hurwitz Italian Splendor Collection fragrances are available in Eau de Parfum and Parfum ($45-60). Note: image via Denver Art Museum. I do not read that sentence the same way you do…I don’t see creamy alpine flowers, but a creamy fragrance that includes alpine flowers. Tom Ford Black Orchid has a truffle note, IIRC. Malle’s Une Rose and Sienne L’Hiver both have truffle accords in them. Yes, truffles have such a meaty, “umami” taste that I think it would be rather odd to smell like one. Adoration sounds irresistible to me–but actually, I want to try them all! Adoration sounds crazy good to me, too! Can’t disagree…it is hard to be an “I want to try everything” sort of perfumista, and include lines like DSH. That said, I just try the ones that come my way or that I hear great things about, and I’ve found many gems in the line that way. Hi Karin. Not to tempt you, but DSH sometimes has sample packs for various collections. I’m still longing to try the Egyptian line that came out last year, but agree it is hard to know where to start sometimes. This year, I’ve just jumped in head first with some indi perfumers and been really pleased. This entire collection looks wonderful. Adoration grabbed me, and my inner gourmand is really intrigued by Secreti di Belle Donne and Venus & Cupid. If there’s a sampler of these, I’m sold. Throw in the Medici and that would be my list! I would be in the same boat, but I happened to travel to Boulder for other things and made a stop at Dawn’s Essence Studio. Fantastic experience, and I became almost not intimidated by the line… until all these new ones came along! They all sound so pretty! I tried some of her Italian Journey ones that she’s already had out. The Giardini Segreti is a really beautiful floral-tuberose and the Gelsomino is a nice lightly indolic jasmine. I sometimes think it would be more fun to just book a trip to Boulder and go in person. There is a lot in the DSH line I’d like to sniff. Mals – I had a chance to meet Dawn last summer while I was teaching at Colorado University. Her shop is quaint and welcoming and Dawn is funny, generous, so sweet and smart. I would recommend a “fummy” get away to see Dawn anyday….. 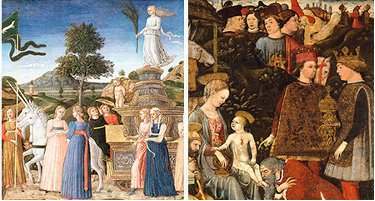 I wonder if the woman-of-easy-virtue perfume will be at all similar to Cimabue. I love the saffron in that scent. All of these sound so lovely — in fact I’m kind of in love w/ the concept of most of DSH perfumes, but I’ve yet to try any. I am saddened that we have a Medici but no Lucrezia, which would need notes of frankincense, belladonna and a cantarella accord. Went over and almost bought one of these unsniffed but I was too indecisive and instead went w/ Reinette from the Perfumed Court collection because some part of me wants to smell like a Madame de Pampadour and I already have my ‘Medici perfume’ in SMN. Also it was discounted to $65 for the antiqued bottle and couldn’t pass on a bargain. All of these sound lovely, but I’m wondering about the olive flower in Alba. The only olive flower note I’ve tried is Demeter’s, which smelled like licorice – not one of my favorites. Then again, osmanthus is a type of olive flower…hmmm.